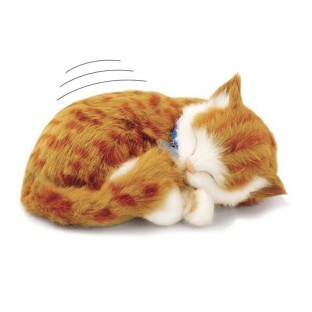 Lifelike kitten actually breathes! This lovable and adorable pet offers a real pet ownership experience without the hassles and expense. Completely comforting and perfect for Alzheimer's patients and those in hospitals and assisted living. Say hello to lots of love and cuddles with the perfect, ultimate pet. Runs continuously up to one month on a single "D" battery (included). Soft and oh-so-real plush synthetic fur pet comes with carrying crate, adoption certificate, collar set, bed and hair brush. This item is activated by pulling a tab that protects the battery (which is included and is also replaceable). Approx. 10" x 7-1/2" x 3-1/2". To clean, use a damp cloth to gently surface wipe/wash. It is cute but other than the breathing mechanism is realistic it is less than expected. First it does not have an on off switch you have to literally unscrew the bottom and remove the batteries. The purring is not loud enough to be heard and the fur pulls away from the plastic fairly easily. I love my kitty. Would happily recommend Perfect Petzzz! Precious is a constant companion in my apartment. I had to euthanize my cat Missy. Precious has become my buddy! This is very realistic and the residents love it. I received the Tabby cat and it wasn't working properly. I contacted SS and they immediately shipped me a new one which was so important since I work with the elderly. Thank you SS!! Very nice life like exactly as promised. The elderly hold this cat and enjoy it.